LOUISE WECHSLER grew up in Fall River, Massachusetts, and attended local schools until she matriculated at Columbia University, from which she graduated in 1960. After receiving her AB, she worked as a bilingual guide, in Spanish, at the United Nations. At the same time, she was working on a master's degree in Latin American Area Studies, which she completed in 1973. In 1966, she married David Wechsler, a Pennsylvanian, and together they decided to spend their honeymoon years working in Puerto Rico. Upon returning to the US, Dr. Wechsler gave birth to her two children, her son, Raphael, in 1968, and her daughter, Elena, in 1970. By this time, her intense interest in veterinary medicine led her to return to school to complete the necessary requirements to attend veterinary school. She graduated from the University of Pennsylvania School of Veterinary Medicine in 1979 and embarked on her career in small animal medicine. 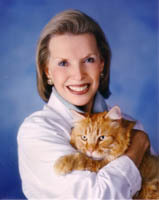 Having worked in small animal practices for many years, Dr. Wechsler decided to open a house call practice in Chadds Ford, Pennsylvania, while maintaining a working relationship with one clinic for over twenty years, where she was able to perform surgeries. Starting in 1999, Dr. Wechsler began journeys to Cuba, which happened to be the focus of her master's thesis. Very quickly, she developed a strong relationship with the veterinary community and hosted the first Cuban American Veterinary Conference in Havana, in 2005. She continues to make regular visits to Cuba in order to continue her volunteer work there. Louise Wechsler speaks fluent Spanish, conversational French and Portuguese. In 2006, Dr. Wechsler moved permanently to Little Compton, Rhode Island, and opened up a house call practice that serves Eastern Rhode Island and Southeastern Massachusetts. The problem of the feral cat population in this region quickly became evident to her and this video, "Are You Ready For A Cat? ", is an attempt to create an awareness of the feral cat problem, to encourage neutering, to prevent adopted cats from being abandoned and to raise proceeds which will be converted to donations for cat shelters in both English and Spanish speaking households and countries.